Sometimes it’s hard to find inspiration. I become blind to the individual beauty of each piece… they all start to look the same. At times like this, I seek Joe’s help. His expertise enables me to see beyond a one-glance appraisal, he opens my eyes to the wonder of ancient techniques and antique craftsmanship. When Joe placed this coral carving in my hand, he said “This piece is really something special.” And he was so right. Joe LOVES cameos, our collection boasts more than 100 of them! 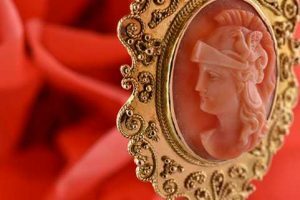 I am more of a cameo appreciator than a cameo lover. A warrior, in full regalia with a Griffin adorned helmet and flowing locks of hair is shown in profile. It’s fitted into an elaborate Estruscan beaded frame. 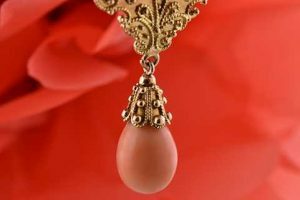 The outer edge of the frame is scalloped then encrusted with scrolling lines and tiny golden beads with a tear-drop shaped piece of peach coral dangling from the bottom. 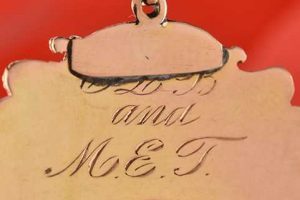 When I flipped the necklace over, I discovered my favorite part… the inscription. 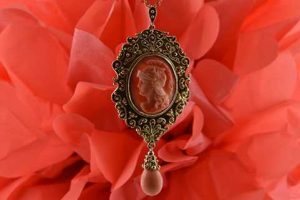 This lovely Art Nouveau pendant was gifted on October 12th, 1907. That’s over 112 years ago. 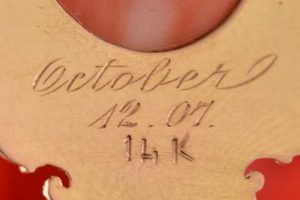 The pair of initials leads me to hope that perhaps it was a betrothal or wedding gift. I’m a hopeless romantic! 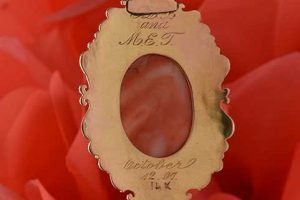 Newly added to Joe’s Special Box, this carved coral confection is available for $2,650.00. You can go to a museum and look, or come to us and touch.